This item is covered by i4e Marketplace Return Policy. Pros: - Works out of the box for Windows 7. Installed the machine into an available PCI-E slot, booted machine, Windows 7 recognized a new device, searched for drivers, installed drivers, etc. - Linux works out of the box, too. Cons: - Linux drivers are SOURCE CODE ONLY and compiles into a kernel module; the compilation is "easy" and "straightforward" if you have the tools (like I do), but you will need to provide your own signing certificate! - One was DOA, had it replaced. The replacement works out of the box without any custom drivers. Other Thoughts: Bought two -- put one in a Windows 7 machine and the other in a Fedora 27 machine. Windows 7 works out of the box. I'm still trying to get Fedora 27 to work. Both devices appear to be as advertised and in good working quality (sans drivers on Linux). Connected a Cat6 cable between the two devices, and get green lights and Windows attempts to communicate (so it *looks* like the cards are working). NO drivers in Linux means it can't communicate though. Intel provides drivers (both in a CD in the package as well as online) for Linux, but the non-Windows drivers are SOURCE CODE ONLY. You need to compile the drivers. Compiling the driver requires an encryption signing certificate (.pem) which IS NOT INCLUDED in the drivers. You will need to provide your own self-signed key! Seller was able to honor a return policy and the dead-on-arrival merchandise was replaced. Now both machines talk at 10Gbit/s out of the box. iperf3 shows 5Gbits/s on a single TCP stream without any tweaking, and multiple simultaneous iperf3 sessions will utilize about 9.5Gbits/s. Overall pretty happy. Newegg won't let me post a blog post or screenshots though or I'd share that. Other Thoughts: Had an issue with the network adapter, reached out to TDT and the quickly shipped us out a replacement along with a return label. Thank you so much for the excellent customer support! Pros: Dual network ports over RJ45. Other Thoughts: Overall you can't beat Intel network cards in the server market. They are fast, reliable, and the most stable drivers on the market. 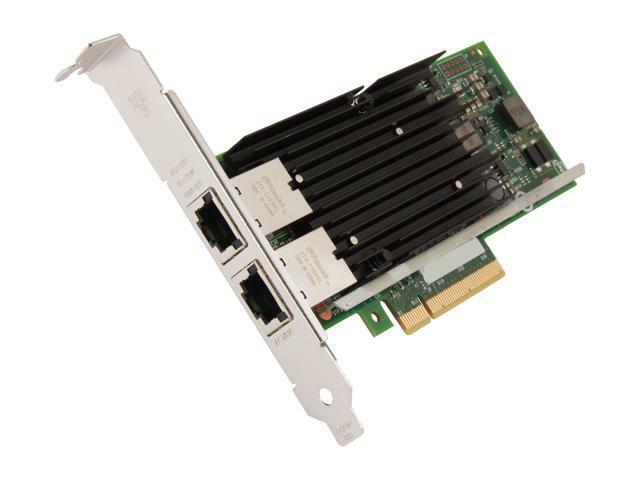 Even if you don't have a 10Gb switch this is still a good card to put in your server, as that is one less thing that needs configuration when you do upgrade your network equipment. It doesn't come with a driver disc but I believe most sewer server OSes will have native support. I know for a fact VM Ware ESXi 5.5.0 u2, Citrix XenServer 7.2 and Citrix XenServer 7.3 have native drivers for this card. Other Thoughts: In the world of servers reliability and stability is key. Intel network cards are in my opinion your only choice. They have extremely stable drivers for every server OS, and I've never had an Intel network card fail in the 14 years that I've been doing server support. In the end this card is Its a little costly but it is extremely fast, and reliable. Pros: Does exactly what it is supposed to. Setup was as easy as any other networking card, except ten times the speed! We put one of these on our server, and on our video editing workstation. We have a Netgear 10gbe XS708E switch between them. They are all connected through shielded CAT7. In a realistic day-to-day use, it's usually around 300 to 500 MBps. In some specific scenarios (large ISO files, etc) it goes to over 700MBps. This easily maxes out the SSD on the workstation! We no longer have to copy video files locally at our studio, instead they can remain on the server. It was very easy to set up link aggregation. I managed a peak of roughly 1.8GBps transfers to the server in specific scenarios, like setting up a ramdrive, running ATTO, etc. Cons: Kinda pricy, but being able to stream our huge Nuke and AE composites from the server without lag has more than paid for itself. Other Thoughts: The NIC worked great and as expected. But full 10gbe switches are still expensive and LOUD. Not recommended for home use unless you can avoid using the current range of 10gb switches.